Hainan Airlines, for the second time, was named as the Best Airline in China in the 8th Annual GT Tested Reader Survey Awards conducted by Global Traveler Magazine. The airline won the award in 2008 as well. The award was bestowed on the airline at ceremonies held in Beverly Hills, California last evening and accepted by the airline’s North American managing director, Joel Chusid. Global Traveler is a well-known and respected magazine in the United States which is read by thousands of upscale travelers. The publication follows news globally about airlines and hotels and travel in general and is popular with people who travel frequently. The GT Tested Reader Survey Awards are based on an annual poll of readers and select winners in several categories. The awards have become well known in the eight years they have been conducted. Average income of readers exceeds $340,000, and GT readers average 32 round trips per year. Ninety-five percent of the readers have taken a foreign trip in the past three years, averaging a total of 16 trips. Nearly all readers travel premium class internationally. Francis Gallagher, the publisher of Global Traveler, remarked "Hainan Airlines is devoted to the premium class passenger. 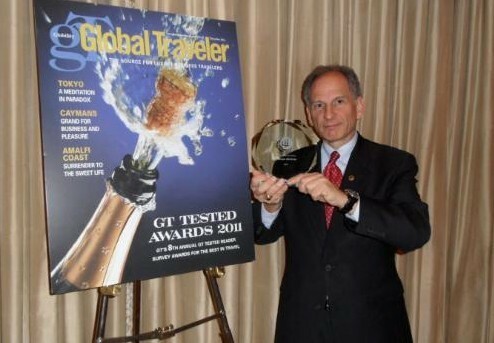 Their service has surpassed many competitors and I am pleased that the readers of Global Traveler have voted Hainan Airlines Best in China." "Hainan Airlines is pleased to be honored by the readers of Global Traveler magazine again. Since we began service to North America, our name has gradually become associated with high quality service," according to Mr. Chusid. "We were awarded Skytrax’s five-star certification last year, only one of seven in the world and the only Mainland Chinese airline in that exclusive club. Safety is always our primary concern, but ultimately, it’s our great service that breaks the ranking. Our people have worked hard to deliver the finest product in the marketplace, and it is encouraging to see that people have noticed." Hainan Airlines traces its origins back to 1993 in China and began its first international route in 2001. Since then it has expanded globally to several cities in Europe, Africa, Australia, Asia and, in North America, Seattle and Toronto. Most recently it added service to Istanbul and just last month, the Maldives. The fleet is very modern, with both Boeing and Airbus airplanes. Hainan Airlines is proud to be a launch customer of the new Boeing 787 Dreamliner which is scheduled to be introduced in a few months. Service to the US is currently provided by new Airbus A330-200 aircraft which features a top notch premium product featuring 34 fully-flat business class seats with 74" pitch, a massaging mode and individual power outlets. Mr. Hou pointed out that "passengers may dine on gourmet cuisine when they wish and, when they’re ready to sleep, our cabin crew makes up a bed with fluffy cotton pillows and linens and offer complimentary pajamas, amenity kits and slippers. There’s even an espresso machine on board. All passengers have access to dozens of video and audio selections on demand. Business class passengers are also welcome to take advantage of Hainan’s exclusive complimentary private limousine service for both arrival and departure at Beijing, with prior arrangements. Our Seattle gateway has allowed us to offer the fastest flight from the mainland United States to mainland China, and thousands of people have used it. We are also elated at how many repeat customers we have."